U.S. Patio Systems and Home Remodeling proudly installs walk in tubs throughout Minneapolis, Minnesota, and across the Twin Cities region. We are a full-service bathroom remodeling contractor with many years of walk in tub installation experience. Our supplier – Safe Step Walk in Tub Co. – manufactures walk in bathtubs of the highest quality with features that are designed for both safety and therapeutic purpose. 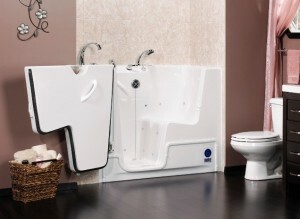 The installation of a Safe Step walk in tub will drastically improve your bathing experience. In addition to lowering the risk that you will slip, fall, and become injured, using a walk-in tub instead of a conventional tub or shower will allow you to have 24/7 access to medical-grade hydrotherapy right in your own home. Hydrotherapy is a centuries-old medical practice that has many proven physical and psychological benefits. Taking a long, hot soak in a walk-in tub on a daily or periodic basis is great for relieving the symptoms associated with stress, anxiety, insomnia, back pain, chest congestion, lumbago, shingles, sciatica, and varicose veins – just to name a few. Contact U.S. Patio Systems and Home Remodeling for more information. We install walk in tubs from Safe Step Walk-in Tub Co. throughout Minneapolis, MN, and beyond.